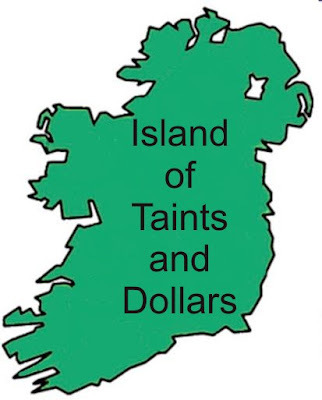 In some of my recent past Posts/Rants I was expressing the need and the hope that the Irish Parliament might see fit to show some moral backbone and lead the country from the front by taking a 50% cut in their truly massive, and now immoral, salaries and pensions. This proposition however would seem not to have struck a positive chord from our leaders. The actuality would seem to be quite the opposite in fact. With retired former politicians having the cheek to publicly state they will not budge voluntarily. It would appear that it will take a legal crowbar or legislative JCB to force any reduction whatsoever from these greedy people. "Screw the population - we are holding onto what we have" - is the war cry from our elected leaders! A taxation like this is designed for one reason only, to squeeze the little person. By squeezing them even more when they are under great financial stress you create a hostile environment and then begin to antagonize. Rebellions do rise out of a true hear felt resistance, however at times they are social engineering schemes at the root of it all. The social engineering scheme is for greater control of the less fortunate. We have something similar happening in America today its called a health care tax, if you do not buy health care insurance that is mandated by the government you are then taxed, you refuse to pay the tax you are then fined and can be punished with up to two years in prison. When you see what is being implemented upon your country, as well many other countries such as what we are witnessing being implemented upon Greece, we are now seeing the same things arise in many other countries around the world. Do I hear Spain anyone? How about Italy? Is it possible in France? England, Germany? Switzerland? Are witnessing the formation of a world wide consolidation of power? Truly massive, and now immoral, salaries and pensions. This is a world wide phenomena, and especially rampant in the USA. What the politicians do not understand is that most of them if not all are pawns in a move towards globalization. This is a much broader problem than what you are seeing in Ireland, we must open our eyes and observer the world wide patterns that are emerging in this area, they say the system is to blame and it is flawed therefore it must be changed, I agree but the change that will come next will not be for the benefit of the little person, it will appear to be so but in the end will turn out to be a ginger bread house. I hope Hansel and Gretel left enough bread crumbs to find their way back when the trap has been sprung.